KOLKATA: Kingfisher East Bengal recorded their first home win of the Hero I-League this season as they got past defending Champions Bengaluru FC, courtesy of a goal from Abhinash Ruidas, at the Salt Lake Stadium in Kolkata on Wednesday evening. Bengaluru FC had their first real chance of the match, within just five minutes as Joshua Walker played a lovely weighted lofted through ball towards Robin Singh. The Indian international hesitated for a moment which was enough for Milan Susak to put a sliding tackle in, to avert the danger. Sunil Chhetri almost single handedly made his way into the box from the left as he danced past the challenges in the tenth minute, but it was a last ditch challenge from Deepak Mondal that dispossessed the skipper and it was another chance wasted for the Blues. Bengaluru’s bad luck continued, as just five minutes later Walker got enough time and space in the centre of midfield and seeing Subhasish Roy Chowdhury off the line, chipped it delightfully towards goal. It was only the underside of the crossbar that came in the way of the Englishman as the goal keeper was well beaten. Robin Singh though was at hand to pounce on the rebound but he only managed to sky it from close range. In the 23rd minute it was another long range piledriver that was somehow stopped by Subhasish who dived ever so well to his left. This time it was Eugenson Lyngdoh who had hit it ever so well. The Red and Golds who seemed to be sluggish in the attacking half did manage to carve out two half decent chances on either side of the half hour mark. First it was Leo Bertos who squeezed in a grounded pass towards the centre. Baljit Sahni stepped over it to leave it for Ranti Martins, only to see the Nigerian waste too much time, allowing Osano to clear. A couple of minutes later it was another great cross from the left by Deepak Mondal but Ralte was on hand to grab it cleanly, in spite of Ranti going up for it. The Blues had three gilt-edged chances after the 40th minute all of which they spurned. First it was Rino Anto who played a lovely ball out of defense, straight onto the path of Sean Rooney. The Australian, under Milan Susak and Subhasish’s challenge failed to get a touch to it and the ball fell to Lyngdoh on the right. His cross into the box again fell to Rooney who horribly struck it over in front of an empty net. Just two minutes later, Saumik Dey almost paid the ultimate price for his callousness as he allowed Robin Singh to pounce as he failed to bring a back pass down. Thankfully he did manage to go back and put a block in for only a corner. A perfect training ground corner routine failed to bear fruit as Deepak Mondal blocked Chhetri’s ferocious shot after Lyngdoh’s corner had found the India skipper on the edge of the box. The Red and Golds did manage to punish the away team for their profligacy in front of goal and they bagged the lead in the 53rd minute. 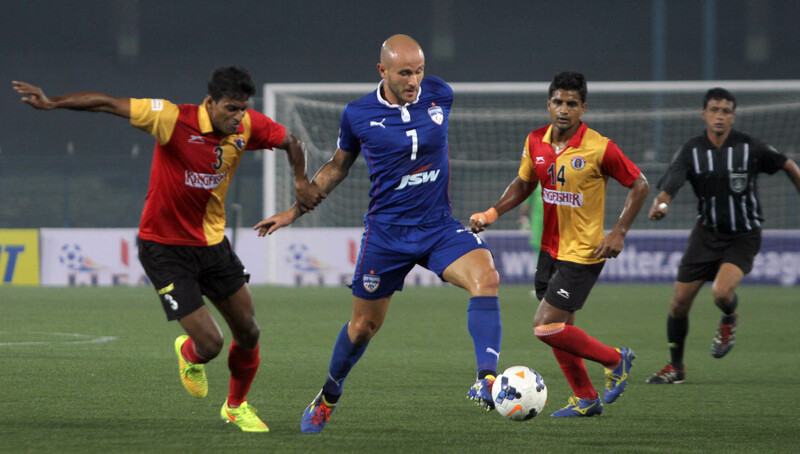 It was Deepak Mondal who dribbled past Keegan Pereira on the right before squaring it across the face of the goal. Although Ranti failed to connect properly with the ball, he did manage to direct it towards Ruidas who was waiting at the far post and slid the ball inside the goal to give his team the lead. After a concerted period of pressure from the rejuvenated Red and Golds, Bengaluru FC finally came back into the game with a flurry of chances which they somehow again managed to waste. In the 66th minute Joshua Walker did so well to squeeze in a cross towards Sean Rooney but his looping header was tipped over by an alert Subhasish. Merely five minutes later, Robin Singh’s pass into the box was missed completely by Arnab allowing Rooney to lay it off to Beikhokhei Beingaichho to take a shot but unfortunately for him, Arnab was at hand to block his shot with a header to make up for his earlier mistake. Rooney was in the thick of things again as he failed to find the target from point blank range after Rino had found him with a perfect cross. This was followed up by Robin Singh who emulated his counterpart and failed to direct his header towards the target after Rooney had found him completely unmarked. Baljit Sahni had the chance to finish off the game for good after Ranti did ever so well to hold off both Curtis Osano and John Johnson. Instead of going for goal himself he passed it to Baljit whose shot failed to test the Bengaluru custodian. With the victory, East Bengal have four points from two matches while the reigning champions are only on a point from three matches so far. Hero of the Match – Abinash Ruidas.